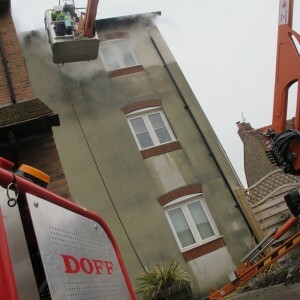 The DOFF cleaning team were out today in Arundel, West Sussex. Our client needed their building spruced up for the summer. This job was no match for the team. Our Easy lift R150 was the perfect cherry picker for the job. MC property Maintenance were asked to come and sort out the roof and guttering and then clean the side of the building. The DOFF system uses pressurised steam to kill and then clean off the bacteria that grows on properties leaving them unsightly.